Even as oil and natural gas production has skyrocketed, industry workplace incidents have decreased over the past decade, according to the American Petroleum Institute’s 2018 Workplace Safety Report. 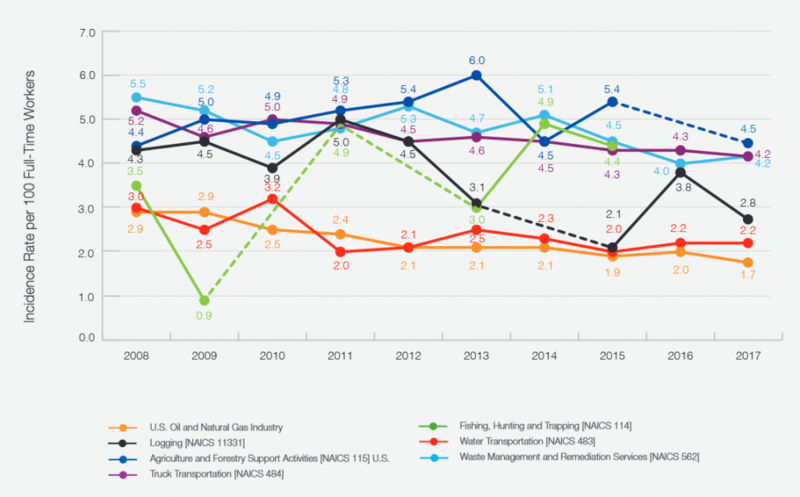 The report compares the rates of job-related nonfatal injuries and illnesses in the U.S. oil and natural gas industry with other comparable U.S. industries from 2008 through 2017. The time period coincides with one of the largest increases in oil and gas production in history, with oil and natural gas reserves hitting an “all-time high,” and the United States becoming a net exporter of petroleum liquids for the first time in 75 years. The API report made clear that growing development in oil and natural gas has not resulted in a decreased commitment to safety: the industry’s incidence rate fell by 41 percent from 2008 to 2017. In contrast, the overall private sector’s rate declined by 28 percent since 2008. 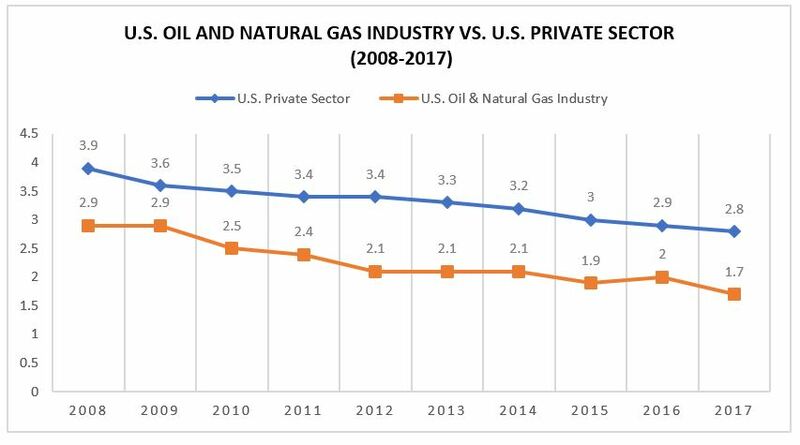 Beyond the steep drop in the incidence rate, the report uncovered that the oil and natural gas industry was consistently safer than the U.S. private sector as a whole. The industry’s workplace incidence rate remained below the rest of the private sector for the entire span of the report and the difference widened when examining the rates between comparable industries. Notably, the incidence rate for pipeline transportation rounds to 0.0 for almost every year analyzed. 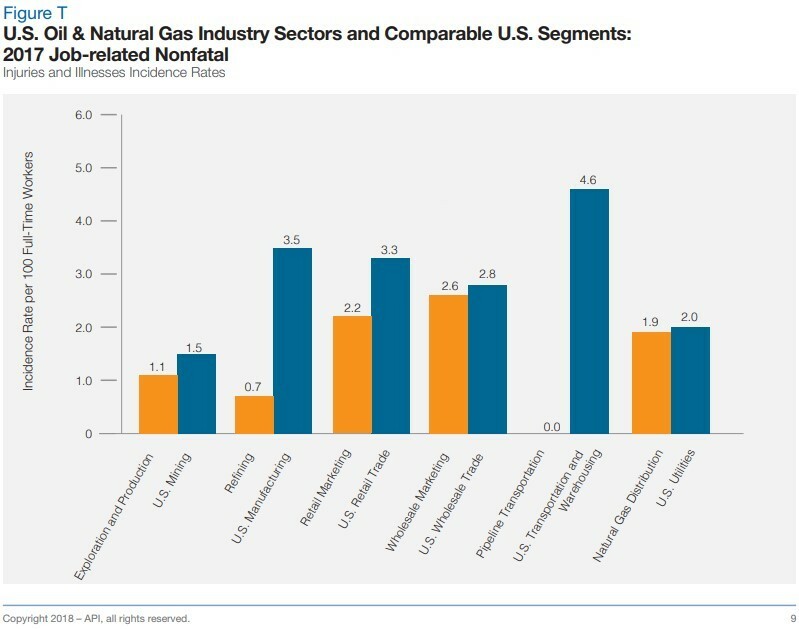 The oil and natural gas industry also had much lower rates in most years than other industries such as logging, agriculture and forest support services, and fishing, hunting and trapping. The API report demonstrates collaborative efforts the oil and natural gas industry has made in recent years to improve worker safety. For instance, the industry’s partnerships with the National Institute for Occupational Safety and Health (NIOSH) and OSHA to help ensure that operations remain safe and efficient have resulted in a number of highly effective programs, most notably the National Service, Transmission, Exploration & Production Safety (STEPS) Network. The partnerships with OSHA also helped create SafeLandUSA, a volunteer organization that includes the oil and gas industry, contractors, industry associations and educators, offering a standardized orientation for workers in the onshore exploration and production industry. In collaboration with NIOSH, the Oil and Gas Extraction Council meets twice a year to discuss worker safety developments with the industry. The commitment to safety, combined with the technological advances in U.S. shale, have made the United States the world’s most attractive region for oil and gas investment. The industry has surpassed production levels that EIA just last year predicted the U.S. would reach in 2030. U.S. oil and natural gas is making the United States a stronghold of energy – one that is mindful of safety as well as growth.